The November issue of CJSM has been out for a week, and I hope you’ve had a chance to look at our latest offering. It is also our last offering for 2013 (CJSM is a bimonthly, publishing 6 times a year). The next time the journal will hit your mailboxes and inboxes will be January 2014. CJSM will be there: will you? 2014 promises to be a big year in sports and sports medicine. The Winter Olympics take place in Sochi, Russia; the FIFA World Cup is in Brazil; and the Commonwealth Games are in Glasgow, Scotland. 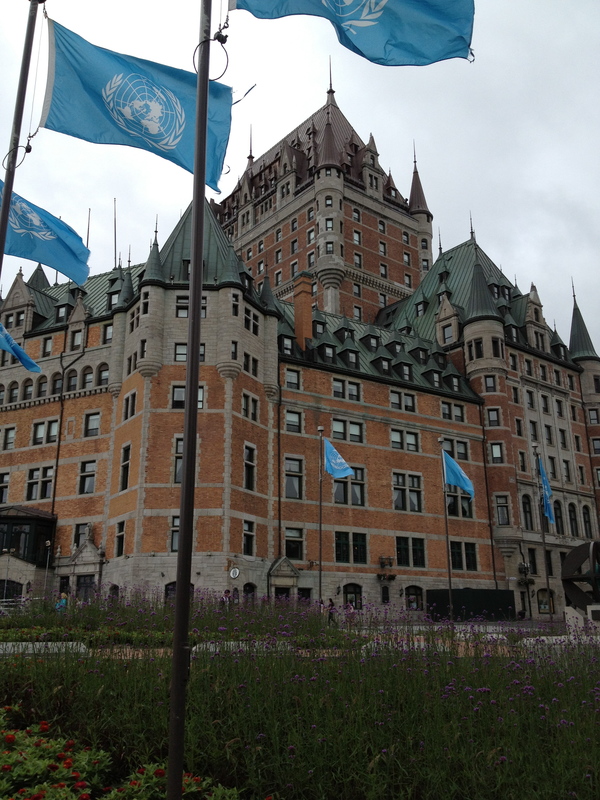 On the sports medicine front, the Canadian Academy of Sports and Exercise Medicine (CASEM) hosts the FIMS 2014 World Congress of Sports Medicine in Quebec City, and earlier in the spring the AMSSM annual meeting takes place in the Big Easy. And this brief listing, of course, merely scratches the surface of what is to come. But before I get ahead of myself, best to hold on to the mantra, “Be Here Now,” and share with you a little of what’s in store when you delve into this month’s CJSM. Headlining the November issue is CASEM’s position statement on the mandatory use of bicycle helmets. This document is a revision of a previous statement made in 2002, and incorporates the medical evidence in support of such use that has accumulated over the last 10+ years. There is an associated lead editorial by Murray Maitland, PhD that is definitely worth a read as well. That’s a rhetorical question mind you! First having ensured the life insurance policy had been paid up, I then read through the CASEM statement, which packs a lot in two pages. The statement surveys the field of what is known about the use of bicycle helmets and injury prevention, and then makes recommendations. Some of the salient points I walked away with: 1) wearing a properly fitted helmet decreases head injuries by 63% to 88% in all ages of bicyclists; 2) introduction of legislation (i.e. not merely relying on education campaigns) is associated with a decreased injury rate and has not been shown to decrease ridership (importantly, as we seek to increase physical activity in our sedentary population); 3) youth populations are more likely to wear helmets where there is legislation that applies to riders of all ages as opposed to only 18 years and younger; 4) youth are more likely to wear helmets when cycling with an adult wearing a helmet (95%) than when cycling with an adult not wearing a helmet (41%). I would concur with those recommendations, and I would love to hear your thoughts after reading the CASEM statement, either here in the comments section or on twitter @cjsmonline. The CJSM executive editor, Chris Hughes, has written about this subject in a 2011 blog post, and notes that the associated poll of the readership taken at that time got more traffic than any other. I’m hoping this month’s articles on the subject, and this blog post, encourages that same sort of commentary. My position on the matter (pro) is uncomplicated. I think the data are clear and in favor of mandatory use of bicycle helmets: mandatory legislation reduces serious injury; it encourages the most vulnerable (children) in the use of an injury prevention device; and it has not been shown to decrease ridership. I don’t think one needs to appeal at all to anecdotal evidence. 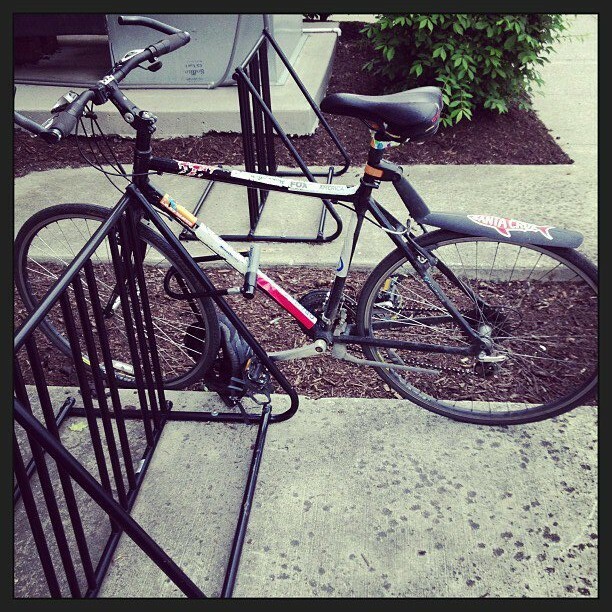 That said, I suppose any regular bike commuter can share a story like mine. Earlier this year, casually biking down a bike path on a windy day, not a car or any obvious danger in sight, I passed a construction zone marked off with flourescent orange, plastic netting. A sudden gust of wind blew a lengthy piece of the netting into the path, and before I realized what was happening, a tendril of the netting had snared a pedal, bringing me crashing immediately to the asphalt. Getting up, I immediately surveyed my bike (of course) for catastrophic damage before doing a survey of self. Bad abrasions on my left shoulder and hip, a large contusion over the latter (months later still is a mild nuisance), and a helmet which was dented–no question without that equipment I would have come away with some sort of head injury, it is only a matter of how severe. My training and interest in public health likewise underpin my support of mandatory bicycle helmet laws, which are little different in my mind than mandatory seat belt laws. Regarding injury prevention in public health, I would suspect most students are exposed to the “Haddon matrix”, which breaks down injury prevention into two axes: time of intervention (pre event, event, post event) and risk factors (host or human factors, agent factors (e.g. equipment), and environmental (including social) conditions). Haddon developed this matrix while thinking systematically about motor vehicle crash prevention, but it can be extended almost universally when considering public health issues: addressing the ‘concussion crisis,’ reducing gun violence in America, or, in this case, reducing catastrophic injury in bicyclists. None of the interventions I just listed were put into common practice voluntarily: I still hear grumbling about mandatory seat belt laws from some friends, and hear spurious arguments about the one person they know who survived a car accident because they had been thrown from a car while those who remained restrained died. Auto manufacturers have frequently dragged their collective feet on these issues. Public Health is ‘pro-health.’ It is not ‘anti-‘ anything really. It is not ‘anti-smoking,’ ‘anti-free choice,’ ‘anti-gun,’ ‘anti-football.’ On a very fundamental level, it recognizes that human beings are frequently irrational. It tries to educate people to help them avoid making unhealthy choices, but it also argues that when someone makes a mistake, it is prudent to try to mitigate the damage of that mistake. It does not take away free choice: public health allows for human error, and attempts to ensure that the person can live another day after their mistake or accident. It uses tools like education and, at times, legislation to push people to make healthy choices. I see the call for mandatory bicycle helmet use in countries like Canada, the UK, the USA, etc. in that light. Take the time if you can to read the statement and the editorials in the November CJSM and let me know what you think. We’re looking forward to a robust discussion. Please respect peoples’ differences of opinion. All comments will be moderated. That’s interesting. Ridership has plummeted in both New Zealand and Australia since MHL’s were introduced in the early-mid 1990’s. Bike share schemes in Brisbane and Melbourne have failed (where they have succeeded in other major hubs where there are now MHL’s). Sydney is currently looking for an exemption to the law so that they can start a bike share scheme. Cycle helmet laws do put people off riding bikes for pleasure. I think we need to stop trying to pretend that they don’t and stop trying to force people to do things they don’t want. Ultimately, would you be willing to throw someone in jail for not wearing a plastic lid while riding? If the answer is ‘No’ (and I pray it is!) then I don’t think cycle helmets are a good candidate for legislation. Both Mexico and Israel recently repealed their MHL’s – why? Because it was a disaster. Ridership plummeted and the overall health consequences were severe. There is no sound ethical standpoint to justify the compulsion of an entire population to wear a cycle helmet. Even from a totalitarian perspective (as is argued in other cases such as seat belt legislation), cycle helmet mandates to not benefit the overall majority. In face, the opposite is true. And from a libertarian ethical stand point, laws should not ever be designed to protect individuals from themselves. I hope Canada doesn’t repeat the catastrophic mistake that Australia and NZ have made. Thanks for those comments, do you have some references/studies with the Australian/NZ data? You make several points and bring up several examples with which I am not familiar: Israel/Mexico. Can you share the data on those countries’ experiences? Thanks very much for sharing your thoughts! As far as research goes, the medical journal is pretty much as thorough and unbiased/objective as you can get. Regarding Mexico and Israel, a quick search on google will give you plenty to read about. Here they did it because they knew their desired bike share scheme would fail if it was implemented while the law prevailed. 2. To get a MHL in place, cycling needs to be portrayed as a dangerous activity. By making cycling out to be dangerous, people are deterred from riding their bikes. Further to point 2 – cycling is actually a very safe activity. We need to stop trying to make it out to be so dangerous. The way some people go on about it, you would think that my daily commute to work was some kind of death-defying act. Cyclists are not falling off their bikes left, right and centre. You think about it – when you go down the street, how often do you see cyclists coming off their bikes? Hardly ever, if ever is my bet. When you compare cycling accidents to the number of cycling trips/cycling hours (refer to medical journal) the % is small. Thanks for the references. Appreciate it. p.s. i really enjoyed the NZ reference, compelling. Basically, a bicycle helmet (PPE) is the least effective form of harm reduction and the last thing that should be done to manage risk. It’s what causes the risk in the first place that needs addressing but that is too politically difficult & expensive for politicians and subservient, risk adverse public servants (& I work as one so I see first hand how poor most of them are.). – Having successfully implemented one of the world’s most successful bike schemes in London without helmets, Mr Johnson said yesterday Melbourne should do the same. – He warned that enforcing a head protection policy threatened to kill off the initiative. – “It’s not how we would have done it,” he said. – “Obviously, it’s up to Melbourne to decide what they want to do, but we took a very clear decision that it would be counterproductive . . .
– He said evidence had suggested that while helmets could prevent some injuries, in the worst accidents in London, “nine times out of 10” a helmet wouldn’t make a difference. I’ll repeat that – “nine times out of 10” a helmet wouldn’t make a difference. OK so you’ll reply – but 1 in 10 times it does make a difference. – It may well do so but that’s not worth introducing MHL and making police harass people who are harmless to others when police have got far more important things to police. If you really want to reduce the 10/10 crashes in the first place, then in Utopia if we got rid of the Automobiles or at least slowed them down to 30kmh in urban areas, then there would be far less childhood bike injuries & far greater reduction in overall injuries since most car crashes would be avoided. I said Utopia but actually in places like Holland they have done that to a large extent and their cycling rates (& obesity rates & health) are far better than USA, Canada & Australia. Of course there are still some crashes – nothing is ever risk free and people will always take some risks or make careless errors. We can say the “goal is zero” till the cows come home but people will always hurt themselves. We should concentrate on reducing the harm they do to others. It’s not bicycles that cause the most harm to others, but the cars. But of course reducing car use is not politically acceptable. As a small example of the political lack of will power, in Australia there’s a tax concession that allows workers (mostly middle class) to get cheaper cars through work and claim it as a work expense without proving any actual work usage. The previous Rudd government was going to close part of that loop hole to save the government a few A$Bs per year. But the car sales people & well off recipients whinged so much in the media that the new Abbott government kept the car subsidies to keep a few well off voters happy. It’s much easier to target the “other tribe”, the less popular cyclists. Society needs to stop blaming the victims and take a good hard look at what actually causes so much death, injury and poor health – motor vehicles. Making the blunt claim that helmet laws “have not been shown to decrease ridership” is simply untrue. You can’t disregard good studies simply because they disagree with your own conclusion. Of course it has been “shown”, so if you feel those results are wrong, challenge them, don’t pretend they don’t exist. I’ll make sure the authors of the CASEM statement are sure to visit the blog to read these comments, thanks for sharing. The authors of the CASEM statement should have done their research properly BEFORE issuing it in the first case. I though medical papers, new treatments, new drugs etc were supposed to be thoroughly researched and peer reviewed BEFORE being published or implemented as policy, approved by Drug Administration & inflicted on the public. Shouldn’t policy statements by medical bodies undergo a similar peer review process before being adopted? Issuing a draft statement for comment before deciding whether to adopt it or not is good practice. This policy statement should be withdrawn and some real research done first. On this linked article – I’d say what health professionals should be doing is be an example & showing the public that exercise is good for you by walking or cycling for transport, (with or with out a helmet depending on the religious conviction in them) instead of driving their BMWs etc everywhere to show off their car. Swedish research showed cyclists live 3-4 years longer that car drivers. Another recent reported said that Tour de France style endurance riders live about 10 years longer. The health benefits of cycling fare outweigh the risks and are well known. If the medical people are so concerned about head injuries they should wear car helmets to set a good example. 1) the CASEM statement has been researched; research can lead to scientific debate. This paper clearly is an example of that. 3) CASEM is a sports and exercise medicine body in Canada. It is not a governmental agency. This is a policy recommendation coming from an exercise advocacy body. It is not policy, it is not being introduced in Canada (if it is some day, then there is proper Canadian government body looking into it). I’m American, not Canadian, and not fully aware of where that nation is on the continuum of possibly introducing MHL. 4) One of the more salient points the CASEM statement brings up is the referencing of research that shows how use of bicycle helmets by adults influences their use by children. I’ve been interested to notice that I have seen almost no comment about that issue in the many people writing in about this. Yes, active commuting has been shown to lead to a population’s health. In the USA, bike riding leads to a number of catastrophic head injuries in kids. Biking has risk like many activities, I don’t think of it as exceptionally risky, and I agree with you about the health benefits, but what to the point of how we can have kids use bicycle helmets more regularly? It is not a no risk proposition, especially in kids. 5) I for one, and I think the CASEM folks likewise, are not advocating for bicycle helmets out of ‘religious’ conviction. It would be about science. And we surely appreciate this robust debate, and especially appreciate many of the thoughtful comments with references. I have been especially interested to hear some of the thoughtful comments coming from the NZ/AUS folks where there is MHL in place. 6) I’m not sure I understand your statement about wearing helmets while driving a car. I agree with your comments about the Maitland article, by and large, and that is why whenever I can I do Ride2Wk and I always do so with a helmet. I live in the USA. I live in a local jurisdiction that has MHL for 18 year olds and under (which I fully support). I am not obliged to wear a helmet, I do so to set an example for the kids. Why the comment on car helmets? “Car crashes remain a significant source of head injury in the community. Car occupants have an annual hospital admission rate of around 90 per 100,000 population. Of drivers who are admitted to hospital, the most serious injury is usually to the head (O’Conner and Trembath, 1994). I made the comment about car helmets because most transport related head injuries are suffered in car crashes by car occupants. If people want to reduce overall head injuries then they need to address the major source of head injuries (cars) not a very minor source of head injuries (bicycles). The people I’ve meet with permanent brain damage (& spinal damage) were mostly car occupants. What’s the ratio of car occupants to bicycle riders with head injuries that you see in hospital? Although of course the ratio is probably different for kids than adults since so many kids ride more often (& maybe more recklessly as I did as a kid) than adults. http://casr.adelaide.edu.au/developments/headband/ http://casr.adelaide.edu.au/publications/subject/#Occupant+protection – Here’s a list of references a mile long on the subject of car occupant head injuries & protective measurements. Note the comic on page 8 of the scanned article. The cyclist and pedestrian have to wear helmets while the car driver is hooning around carefree without a helmet. I’m not sure if the figure out the right side is someone that’s been hit by the car or someone hanging off the side “car surfing”. It’s probably someone who was hit by the car. This is getting off the topic of car helmets and back to the topic of the reduction in cycling due to MHL but also on that page note the comments by Richard Bean with copies of articles that show the reduction in cycling levels. Below is just a taste of what is in there. – QUEENSLANDERS are shunning cycling as a means of transport because of helmet laws and increased traffic, according to the state’s leading bicycle group. While helmet laws have resulted in fewer head injuries _ especially among children _ recent evidence suggests people are opting for other forms of transport. An RACQ survey, released this week, found helmet laws had some serious shortfalls. Only about 50 percent of teenage cyclists in Queensland are using helmets, partly because of a legal loophole prohibiting police from penalising children with monetary fines. The RACQ also found there were 21 percent fewer riders on the road this year, compared with its first survey in 1991. If we want to set a good example for kids then we should be encouraging them to ride bikes (with or without helmets) rather than most of them be driven everywhere all the time and expose them to head injuries in car crashes and sedentary lifestyle disease in later life. Cycle helmets are often promoted on the presumption that cyclists are especially likely to suffer head injuries. The data below shows that cyclists are only a very small part of the head injury burden and that other people are much more likely to be head injury victims. As the proportion of major head injuries that are cyclists is lower than the proportion of all head injuries (although the populations differ), it would appear that on average head injuries to cyclists are less severe than those to other groups. The following table shows the average number of deaths per year over the period 1997 to 2007. The source data also shows that only 44.5% of US bicyclist fatalities involve head injuries (325/730). Major Head and Spinal Cord Injury Hospitalizations in Ontario, 2001-2002. Canadian Institute for Health Information. Ontario Trauma Registry Analytic Bulletin, March 2004. Head Injuries in Canada: A Decade of Change (1994-1995 to 2003-2004) . Canadian Institute for Health Information, August 2006. Coronado VG, Xu L, Basavaraju SV, McGuire LC, Wald MM, Faul MD, Guzman BR, Hemphill JD, 2011. Surveillance for Traumatic Brain Injury Related Deaths: United States, 1997- 2007. Centers for Disease Control and Prevention May 6, 2011 / 60(SS05);1-32. So, if the medical profession seriously want to reduce all transport related head injuries, they should lead by example and wear helmets in their cars. They should lobby government for mandatory car helmet laws. But that doesn’t sound so appealing to people does it. Maybe you need a more reliable, well maintained bike that suits your riding style & conditions? Other than loss of traction, my bikes haven’t let me down & caused a crash in the last 30 years because I always keep my bikes in good condition. Maybe I had some sense knocked into me when I was 12 years old. I had stripped the thread on my front wheel axle so I just left it loose and rode it carefully – until I forgot while going down a hill at about 25-30kmh and saw the protruding manhole that I used to do jumps over. I’m sure you’ll know what came next, the wheel rolling off down the road as the forks came down to the bitumen in slow motion. I took as much force on hands on the handlebars & forks as possible. Then I tumbled forward head first into the bitumen road. Took the impact on my temple & shoulder then rolled down the road. I remember setting off to get my wheel from 50 m down the road. I remember hanging it off my handlebars and starting to walk home (only 200m away). The next thing I know I was sponging off the gravel rash at home. Then I said good night to my invalid grandfather who was the only other person home & I went to sleep. Next day I looked ugly with scabs on forehead, shoulder & limbs but my head was OK. I couldn’t find my bike for a few days as I taken an old shortcut across the neighbours place and left my bike in the long grass. If I had had a helmet on (this was 1976 before bicycle helmets) it would no doubt have been smashed to pieces and people would say “his helmet saved his life”. But I’m still here & an engineer so it can’t have done too much damage. A helmet would have made it more difficult for me to roll with the fall and could have done more damage through rotational injury or neck injury. It’s very understandable for health professionals who see injury, especially kids injuries, every day to say “helmets should be mandatory”. To those people I say “go work in diabetes or heart wards for a while” so you can see what not getting exercise does to people over time. I ride a bicycle everywhere for transport & have got a few scrapes, knocks & scratches out of it. But even though I eat too much chocolate etc, I’m a fairly fit 49 year old weighing 75kg who burns off a lot of energy just by riding & surfing. My similar framed & height father who was never much of a cyclist but drives everywhere is about 95kg & has had 3 stents inserted so far at 10 year intervals. Cycling might have death & injury risk but so does doing nothing & driving everywhere. MHL discourages people from cycling & instead they stay in the car getting fatter. Agreed on some points, and I don’t think achieving risk reduction and improving population health need to be mutually exclusive. I have been very interested in some of the more thoughtful posts looking at research that links MHL with reductions in physical activity. That sort of unintended consequence is an important factor in this equation. We may by physical doppelgangers: I am 50,weigh 77 kg, used to ocean play when I lived in Santa Cruz, California, now try to ride for all errands/commute when I can, etc. I have been in medicine for a long time, have taken care of the Type 2 diabetics, have been in the ERs, now practice exclusively sports medicine, have earned a degree in public health. I have advocated in my career for road safety, for de-emphasizing the supremacy of the car. I don’t think work on that needs to be mutually exclusive of advocating for PPE. I remain an advocate for enhancing bicycle helmet use. I do it all the time, encourage all the folks I come into contact with (kids especially) to do the same. Great to see. It seems we are mostly on the same wave length and I’m glad you have a range of experience to see the side effects of excessive car usage. Advocating PPE is mostly good but it has to be done very carefully so that people don’t get the wrong message that “cycling is so dangerous you need a helmet” so they simply give up & drive a car instead of ride with a helmet. Refer to the Copenhaganize articles & other sites I’ve listed for better explanations than I can write. Personally I think people should always wear gloves and use a rear view mirror. Gloves since your hands are often the first point of contact with the road and if you have gloves on you will probably be able to take more of the road impact on your hands with less pain and so avoid your head hitting the pavement so hard or at all. And they are good for cleaning glass off your tyres. A rear view mirror since some cyclists do get hit from behind and with a mirror you might be able to move out of the way to avoid the crash. But mostly because if you know what is coming behind, then you know if can swerve around that patch of broken glass, pothole or potential opening car door. Traffic coming past is also less likely to scare people if they know it’s coming. But for both I try to put in a way that doesn’t make out cycling to be so dangerous that you need them. And for people who are only riding slowly & mostly off-road away from cars they are not really much benefit. A mirror can even get in the way and snag your handlebars on bushes or fences so they have a risk too. From an opinionated stance, helmets are my governments way of saying “we don’t want to protect you with decent cycling infrastructure, or give you any decent legal protection, so here, put this plastic thing on your head.” And this is why less people ride now. Helmets brought that message home, even if only subconsciously. Repealing MHL doesn’t mean people can’t wear helmets if they ride dangerous roads. If I’m riding through a nature reserve, or around the isolated Yarra river route, or taking the 500m back route to the shops, MHL is a right pain, and does “dangerise” this completely inconsequential act. In terms of the source of problems, October was “safe cycle month” according to Victoria Police who were absolutely nowhere to be seen ticketing vehicles parked in bike lanes, stopping in bike boxes, speeding or any other kind of visible campaign. I even raised with them, in person, the number of speeding vehicles in my street (with many kids) and still no action at all. As a teenager, I came off when I was hit & run by a van (in bad weather conditions). I walked away without any issues, but also had two ‘left hook’ incidences. Now I have a young son, I see these events differently. Am I supposed to thank my government for ensuring I will need to one day put a helmet on my teenager when he rides to school (as children no longer do here), or would I rather they build some decent bike infrastructure (lanes, traffic signals + laws) so he can get there without a collision at all? Am I okay that it’s inevitable he will be in a collision, because he will be wearing a helmet? It’s totally backwards! Treating people on bicycles as vehicles is backwards. We are fast moving pedestrians, expected to mince with ever-increasing number of SUVs speeding through our streets. I hope this rant helps put into perspective why people hate MHL!